In 2016 Meridian was commissioned by the Town of George’s Brook – Milton to complete a water study to evaluate various options to upgrade the existing infrastructure to meet the Town domestic and fire flow demands. The study investigated four options to improve the water supply for the Town. Once the analysis was completed the Town decided to proceed with suppling Milton with water from the existing water supply in George’s Brook. The overall infrastructure upgrades are proposed to be completed in four phases and involves a new distribution system, new intake and pumphouse in George’s Brook, new booster station in Milton and water storage tank. Maintaining the existing water supply to the residents while the new water was being installed. 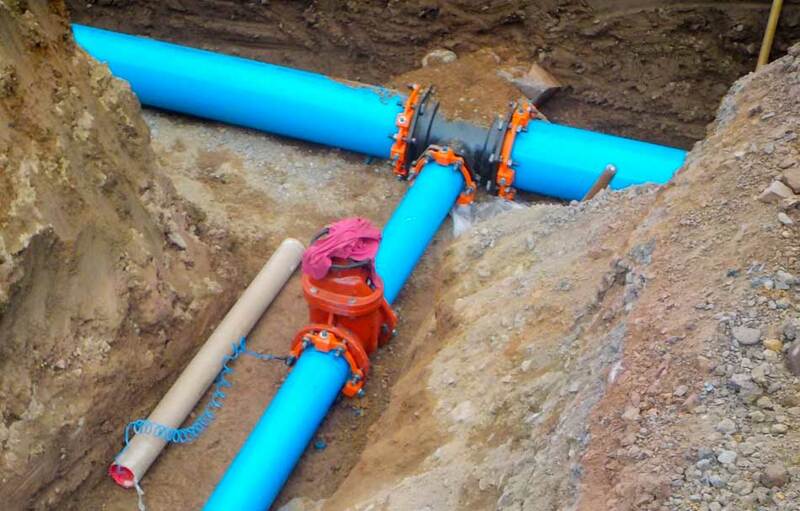 This was done by completing some upgrades to the existing pumping system in George’s Brook to ensure adequate pressure was maintained and through coordination with the Town and Residents. Supplying the residents with water at higher elevations in Milton. It was expected that the Milton water supply would recharge to enable a portion of the community to be supplied but with the extremely dry conditions this did not happen. Thus, it was decided to install a new booster pumping skid in Milton to enable all residents to be supplied from the George’s Brook supply. Maintaining traffic flow during construction was achieved by proper signage, flag persons and adequate notification to the public. In addition, through discussions with the Contractor it was decided to use smaller excavators which limited the damage to the driving surface.